Take me to the standard contact us form. I would like to receive the newsletter with travel deals. Travel nearly 1,000km off the coast of Ecuador and you will arrive at the spectacular Galapagos Archipelago. On your Galapagos cruise, whether you are exploring the terrain of the many islands or off their shores, there is always a surprise of nature lurking around the corner. Sea lions sunbathe on the lava rocks. Pink flamingos adorn the shores of hidden lagoons. Giant tortoises grunt in distant highlands. Flightless cormorants and tiny penguins dart amongst colorful schools of fish, while elegant tropical birds glide through deep blue skies. Words alone will not do justice to the varied and utterly unique flora and fauna found in the Galapagos. The only way to truly appreciate this “heaven on earth” is to see it for yourself. You are sure to experience the Galapagos Islands at their best aboard the luxurious Sea Star Journey, an excellent ship that provides luxury, privacy, and comfort in this marvelous and stunning setting. You will start your exciting Galapagos cruise on Santa Cruz Island. Walk the trail to a hidden lagoon, found behind the beach, where you can observe flamingos, pintail ducks and other species of birds in their natural habitat. Make the short walk to Dragon Hill, where you will enjoy beautiful views of the bay. Start off your day by visiting the north side of Santa Cruz Island, at Black Turtle Cove. This calm red mangrove lagoon is an ideal nursery for many sharks and rays. Here you will take a panga ride to observe large groups of white-tip reef, black tipped reef, and hammerhead sharks, as well as schools of golden rays and spotted eagle rays. In the afternoon, you will head to the small islet, known as the Chinese Hat, named after its shape when seen from the north side. Here, lava formations jut out of the ocean and you will see Galapagos penguins and sea lions covering the volcanic landscapes. Day 3: Genovesa Island- Darwin Bay & El Barranco. After a delicious breakfast aboard the Galapagos Sea Star Journey you will explore Darwin Bay, the favorite island of birdwatchers as it is full of bird species including lava gulls, red footed-booby, masked boobies, Yellow-crowned, black-crowned and lava herons, and yellow warblers. Visitors will take a walk to the edge of the cliff where they can see Red-Foots nesting in the Mangrove trees below and the cliff's edge also offers an incredible view of the island. In the afternoon you will climb Prince Philip’s Steps, leading to a plateau where Masked boobies and Red-Footed boobies can be found resting in a tree and Short-eared Owls have found an ideal place for nesting. With an altitude of 114 meters, Bartolome Island is the perfect place to observe one of the most beautiful sceneries of the Galapagos Islands comprised of lava fields, volcanic cones, lunar-like craters, and the famous Toba formed pinnacle eroded by the sea. In the afternoon you will enjoy Sullivan Bay on Santiago Island before enjoying the last night of your Galapagos cruise. Your final morning of this Galapagos travel adventure will give you beautiful views as you will travel to the Santa Cruz highlands. The rolling hills and extinct volcanic cones covered in lush greenery remind you of the origin of the Galapagos Islands. After your morning in the highlands you will end your Galapagos cruise and be transferred to the airport for your flight back to mainland Ecuador. Note: This 5-day itinerary is one of many cruise itineraries available aboard the Sea Star Journey. 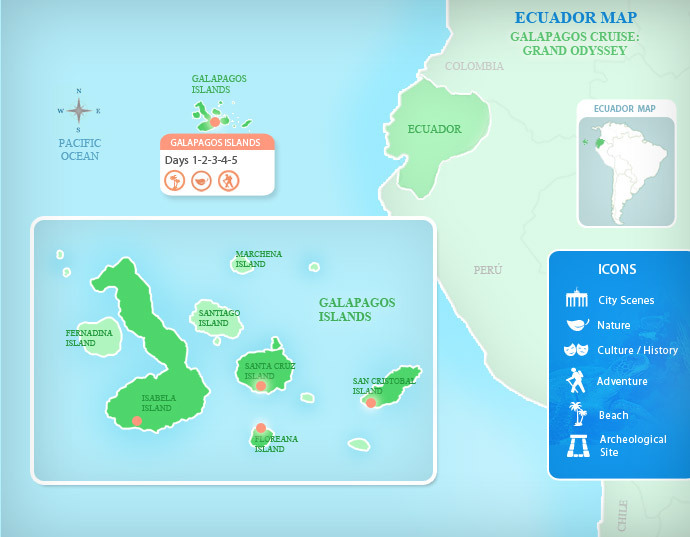 Ask your travel advisor for more details about other exciting Galapagos cruise itineraries. The Galapagos Sea Star Journey offers 8 spacious matrimonial or twin suites and 1 deluxe suite, all boasting panoramic windows, air conditioning, and television, so that you can enjoy the Galapagos Islands from the comfort of your tastefully decorated private quarters. Treat yourself to the flavorful cuisine of the resident chef. Spend your evenings in the Jacuzzis, library, or entertainment room and your days sunbathing, snorkeling, and kayaking surrounded by the spectacular scenery, amazing wildlife, and luxurious service. Have you ever wondered how we choose the Galapagos For Less Top Hotel Picks? Well, this is the job of our Destination Manager, one that is envied by all the staff at LAFL. Throughout the year our Destination Manager travels to all our destinations to check out our hotels and make sure they are up to par. His role is to help us get the best rates at the best value hotels so we can, in turn, offer them to you.